View from the AUG control room during last weeks experiments. 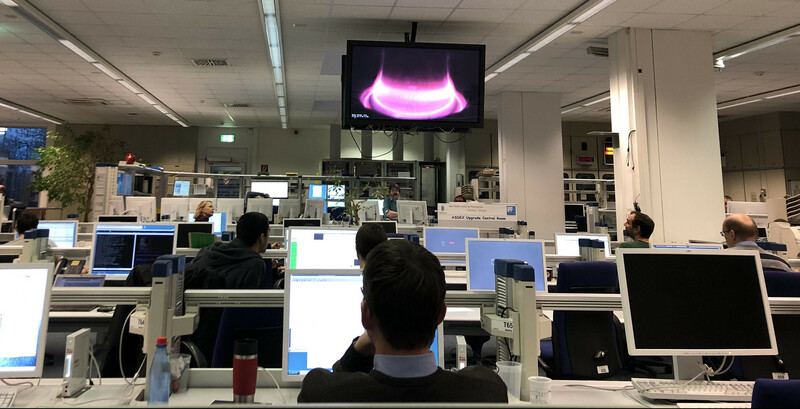 Our group leader Dr. Mervi Mantsinen and PhD student Dani Gallart worked last week at the Max-Planck Institute for Plasma Physics (IPP) at Garching, Germany. They participated in the experiments on the ASDEX Upgrade (AUG) tokamak as part of the EUROfusion 2018 Medium Size Tokamak (MST1) experimental campaign. Mervi was the scientific coordinator of the experiments that successfully proved the use of waves tuned to the third harmonic ion cyclotron resonance of deuterium (D) to heat the plasma. Various diagnostics including neutron detectors and neutral particle analysers confirmed the presence of energetic D ions accelerated by resonant wave-particle interaction. These experiments are the continuation of experiments related with ICRF heating and fast ion physics carried out, analysed and modelled by Mervi and her collaborators. For more information on earlier results refer to this blog entry and these papers: “Third harmonic ICRF heating of deuterium beam ions in ASDEX Upgrade” and “Bulk Ion Heating with ICRF Waves in Tokamaks”.